It’s that time of year again, and Peace Love Productions is helping you set the tone for Halloween by giving away a free pack of scary voice loops. The free loop set offers 20 menacing male voice loops performed by Johann Smit from the goth / industrial / EBM group Khemique. Phrases include spoken word poems, laughter, howling, and single words (“Halloween,” “arise,” “trick or treat,” “beware,” and so forth, all recorded in a sinister voice, of course). What’s more, all loops included with this free pack are royalty-free for use in all your “scary” productions. Each loop is tempo synced to 100 BPM and presented in 16-bit, 44.1 kHz stereo. The loops are available in Apple Loops, ACIDized WAV, and ReCycle REX2 formats. Peace Love Productions suggests using these male voice loops for YouTube videos, haunted houses, Halloween music, and more. For the chance to win some more loops, enter the Peace Love Productions contest associated with the scary vocal loops pack. To enter, create an interesting audio piece using the scary male voice loops, and send Peace Love Productions a link to your work. The sample and loop site will then choose the best piece and give the winner of the contest a free download pack of his or her choice (up to $29.95 in value). To preview the scary vocal loops and hear what they are all about before you download the pack, visit Peace Love Productions at peaceloveproductions.com. The audio demo might make you think the loops are more amusing than scary, but just remember that when it comes to All Hallow’s Eve or any other creepy event, setting the tone is everything — dim the lights, decorate your porch, and most importantly, dress for the occasion. 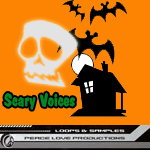 For more information about the free pack of scary voices, visit the Peace Love Productions Web site. This entry was posted in Sounds and tagged Freeware, Peace Love Productions, PLP, Samples, Sounds, Vocal, Voices. Bookmark the permalink.